Have you ever been out to eat at a restaurant that had cloth napkins? If you haven’t, then here are a few things you should know if ever you do step into a restaurant that has them. If you have, here are a few things to keep in mind. I cannot stress this enough. I can’t even count the amount of times I’ve walked by a table only to see a guest blowing their nose into our cloth napkins. To say it’s disgusting is an understatement. As a server, I am obligated by the management to clear the table the best that I can after you’ve finished your meal – that includes taking off all the cloth napkins. In all honesty, I do not want to touch a cloth napkin that has (for lack of a better word) gooey boogers stashed away in them. It’s unsanitary. So please, if you need to blow your nose, ask for a tissue or excuse yourself and make your way to the rest areas. Some how, some way, cloth napkins seem to “fall into purses” or are accidentally left tucked in someone’s shirt on their way out. Cloth napkins are not free to take home. They belong to the restaurant. Leaving with cloth napkins (or anything else of the sorts) is considered theft. Please leave the napkins at the restaurant. It’s very nice when guests inform me that they haven’t used their cloth napkin and I can reuse it. But, to be honest, I wouldn’t want to. Imagine you’re sitting at a table with your untouched cloth napkin on the table next to you. Throughout the meal, people are talking with their mouths open, little bits of food may be flying off of forks or spoons, wine is spilled, and crumbs are scattered. Would you want that napkin knowing it was on someone else’s table before yours? I don’t really think you would. You’re right, you may not have used the cloth napkin, but chances are that something has fallen on it. We would never want to take that chance, so we throw them out to be cleaned no matter what. It’s very nice of you to want to save us time and energy, but we make sure they stay clean. Remember these few things the next time you go out to eat. Simple little things can go a long way and make your dining experience all the better. Follow The Waitress Confessions on Twitter! Looking forward to hear more true stories about what happens in the restaurant business? 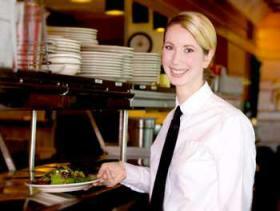 Want to learn the do’s and don’ts as a server and a diner? Ever wonder what the proper etiquette is while dining in a restaurant? Need to have a better work ethic? All of these things and more are available on The Waitress Confessions. Follow us now on Twitter for more updates and quick tips and thoughts. Hope to see yo u there!